The Fountek NeoCD3.5H is a horn-loaded true ribbon tweeter that uses a reinforced sandwiched-aluminum ribbon diaphragm together with a strong neodymium magnet. 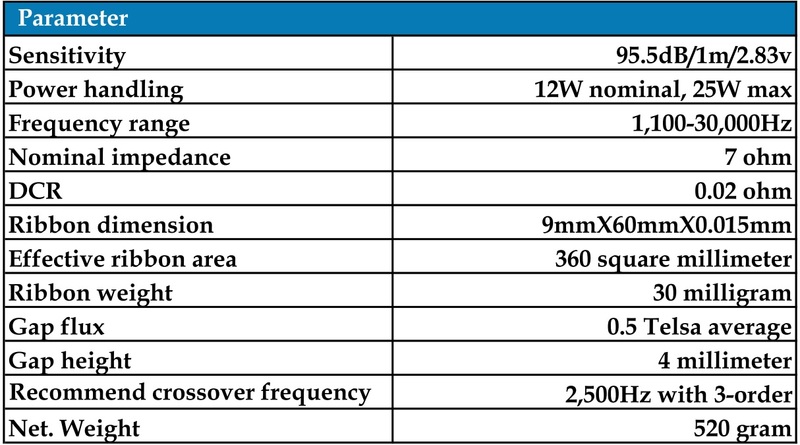 It has wide horizontal off-axis dispersion, an extended frequency response and for a medium sized ribbon good vertical off-axis dispersion as well. This is the NeoCD3.5H parameters published by the Manufacturer. 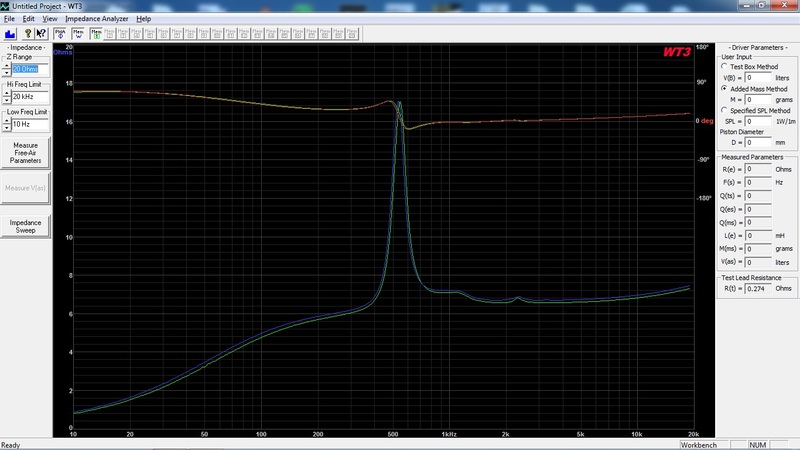 Almost identical impedance curves with only a small difference in the nominal impedance between the two ribbon tweeter samples. Driver position: No flush-mount, mounted on center-line with driver unit center 8cm from the top of the baffle. Protection: A 47uF protection cap is used. They have essentially identical frequency responses. From 15kHz up to 20 kHz we have a rising frequency response on-axis, but as we go off-axis it smoothes out. Even though the ribbon tweeter isn’t flush-mounted in this measurement, the frequency response is flat without any large dips or peaks and it doesn’t seem like flush-mounting is necessary. This makes the enclosure building an easier task. 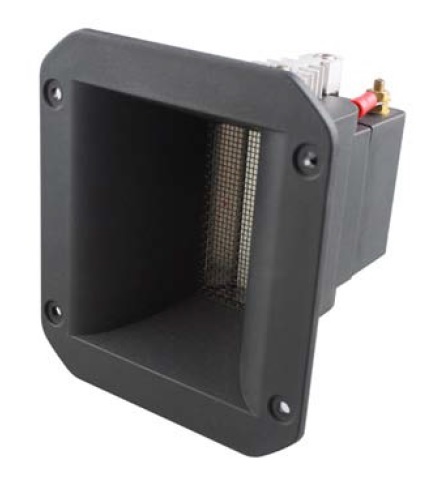 The NeoCD3.5H ribbon tweeter has a very extended and wide off-axis frequency response. 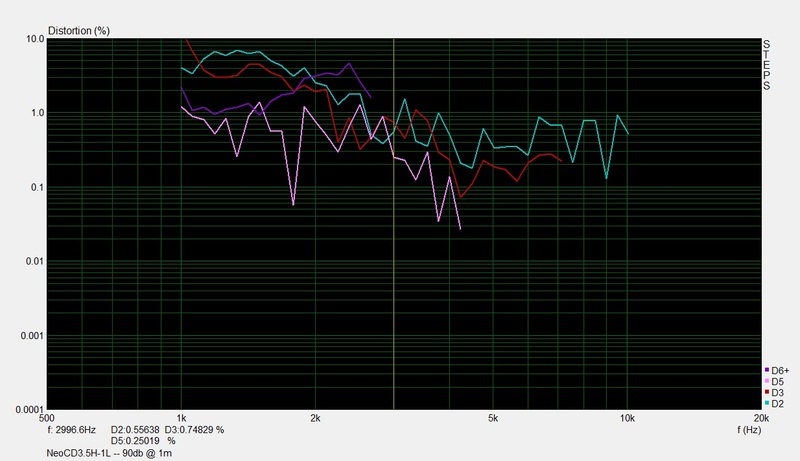 We can see that tweeter sample 1 has a higher distortion profile at higher frequencies than the sample 2, but with only two driver samples to test, we cannot tell if this is an overall driver consistency issue or not. Compared to a 1” dome tweeter, this small ribbon tweeter has an overall higher distortion profile, but with a proper cross-over design the distortion can be handled and shouldn’t be an issue. The NeoCD3.5H ribbon tweeter should preferably be crossed-over at 4kHz or higher, but a 3-3.5kHz cross-over point can work if steep filters are used e.g. a fourth-order (acoustical), third-order (electrical).